← Ready. Set. WRITE! 2015 – I mean it this time! Ready. Set. WRITE! 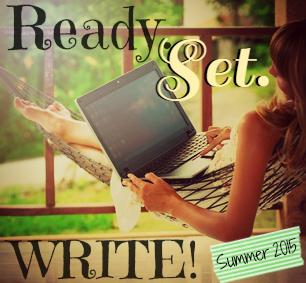 is a summer writing intensive that encourages goal-setting and accountability, and provides an opportunity for us to cheer each other on wherever we’re at with our writing projects—planning, drafting, revising, or polishing. This year, your RSW hosts are Alison Miller, Jaime Morrow, Erin Funk, Elodie Nowodazkij, and Katy Upperman. All the details are HERE. It’s time for the first update of RSW! 2. My goals for this week. Spend at least one hour, five days on reviewing and revisions in my WIP. Visit the blogs of at least 10 other RSWers. Spend one hour a day or less on TV. Spend one hour a day or less on internet. 3. A favorite line from my story OR one word/phrase that sums up what I wrote/revised: A good word that sums up my progress this week: Finished! At least for this round. Now I need to do another full read-through before sending it off to my beta reader. 4. The biggest challenge I faced this week (ex. finding time to write): My old friend procrastination. 🙂 Even though I did well on TV and internet time, there’s always other stuff to divert my attention! 5. Something I love about my WiP: I was working on the last pages of the WiP this week and much of it has to do with letting go of the past and forgiving yourself. It’s an interesting topic to dig into. I’ve got a pretty boring past (at least, a lot more boring than my characters!) so it’s interesting to think about how you would go about forgiving yourself if you had done some truly horrendous things in your past. How did your week of writing and/or revising go? This entry was posted in Ready. Set. WRITE, Writing and tagged Writing. Bookmark the permalink. The biggest problem I have with the internet is that mindset of “oh, I’ll just do a little surfing for a few minutes” and before I know it, a whole hour has gone by! It would be hugely beneficial for me to actually pay attention to the amount of time I am online. I may have to set a timer or something! Have a great week, Jaime! Yay for finishing this round! And the Freedom app works magic for me. When I’m drafting I combine it with rounds of Pomodero and boum, productivity 🙂 Cheering you on for this week, Kitty! I’m sure you’re going to do GREAT! Thanks Elodie – and thanks for the encouragement. 🙂 I’ve meant to download Freedom for ages and I don’t know why I haven’t done it sooner. Maybe because I am a master procrastinator?! Have a wonderful week! Congrats on finishing your revisions! It’s really interesting what you’ve got going on at the end of your WIP- trying to forgive yourself for something you did. That would definitely be something interesting to explore. Hi Melanie – I’m so happy to be done with another round of revisions and hopefully I’m pretty darn close to being “done” for real!! 🙂 Have a great week! Hi Emma – Yeah, I think that the internet is the absolute worst of the distractions because the time you spend on it seems to creep up without being noticed! Have a great week! I really like your goals to spend less time watching TV or online because they are worded in a way that allows success. I think that’s really great. I hope you overcome other forms of procrastination this week (strange that procrastination always seems to win, even if we reduce the most obvious forms). Good luck during week 2! I realized after last week that I left those goals too vague (spend “less” time…) so I thought I’d better put actual numbers with them this week! And, yes, it is amazing how procrastination can take so many forms to run us off track!! Have a great week! Your WiP sounds amazing and congrats on finishing a round of revisions! That’s so exciting! I hope next week is a super productive one for you – sounds like you’re on a roll! Thanks Alison – I do feel like I was on a roll last week and so far this week is lookin’ good. Woohoo! 🙂 Have a great week! Great job on finishing a round of revisions! I’d never even heard of the Freedom app before, so I had to look it up. Interesting concept, especially for writers. Glad you found it useful! Best of luck with your goals next week! Thanks Erin! The Freedom app is pretty cool and it’s so inexpensive. My husband rolled his eyes at me when I explained to him what it does. “And you paid for that?” Yes… yes I did. I am willing to admit that I have very little self-control when it comes to procrastinating on the internet! 🙂 Have a great week, Erin! That’s so great that you’re stretching yourself to write about a character whose experience you can’t exactly relate to. I get so nervous about doing stuff like that, but it’s so important. Writing what you know is great, but if that’s all you write then you’ll be super limited in your storytelling. Glad you had such a great week! Thanks Karyne – it is nerve-wracking because I really don’t know if I’m getting it right! Have a great week! Congratulations on doing so well on your goals! It feels so awesome to be finished with a book, at least for the latest round. I wrote about 12,000 words the first week, and feel like I’m making up for all that lost time when I had to put this WIP on mostly-hiatus to finish my massive other WIP. Wow – congrats on 12,000 words. That’s amazing! It’s funny how we hate to leave our projects on hold for other projects and can’t wait to get back to them but yet the lure of that shiny new idea pulls us away anyhow! Good luck on your goals this week! OMG Good luck on the TV and Internet part. They just dropped the new season of Orange Is the New Black last week and I found out on Sunday and I’m already almost finished. I love the idea of the Freedom app…. I usually just have a timer that tells me when to disable my wireless adapter. Or I go to a cafe that has lunch time limits on the internet…. Isn’t both awesome and somewhat frightening that we expect to be online as much as we are? Yes – awesome and frightening. I agree! 🙂 I like your idea of a timer. I need to do that for my tv time. 😦 Have a great week!